C. S. Lewis writes about what the Bible calls the “Good News”: “God became man to turn creatures into sons: not simply to produce better men of the old kind but to produce a new kind of man. It is not like teaching a horse to jump better and better but like turning a horse into a winged creature” (Mere Christianity, p. 167). The message of Jesus has been distorted in recent times in culture. The gospel of Jesus is not a message that we can be trained to run faster and jump higher in a race of moralism. The historic work of Jesus is still relevant in the twenty-first century because, despite the advancement in technology and communication, the distance between us is greater, and the bloodshed of hatred continues to spill, spreading our “Ground Zero” conditions all over the world. We cannot possibly meet God’s standard of righteousness and goodness. We do not love each other. We cannot even keep our own promises, let alone God’s commands. St. Paul reflects on his own efforts of trying to meet God’s standard and confesses: “What a wretched man I am!” (Romans 7:24). And he emphatically states, “But God demonstrates his own love for us in this: While we were still sinners, Christ died for us” (Romans 5:8). Jesus’s love for us can only be received as a gift. Only when we rest upon him as a gift, does he give us wings, to hover between heaven and earth. These wings are gifts of grace, aligned to the original intention for our being. Our journey will begin in a Garden and end in a City. We are headed toward the City of God, a reconciled city, humanity, nature and God. . . .
Makoto Fujimura is an artist, writer, and speaker who founded the International Arts Movement (IAM) in 1992. A presidential appointee to the National Council on the Arts (2003–2009), he has contributed internationally as an advocate for the arts, speaking with decisionmakers and advising governmental policies on the arts. Fujimura’s work is exhibited at galleries around the world. A detail of his work can be found on the cover of this magazine. For more, see www.internationalartsmovement.org or www.makotofujimura.com. Fujimura was named director of Fuller Seminary’s Brehm Center for Worship, Theology, and the Arts in 2015. 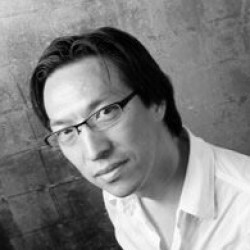 Makoto Fujimura is an artist, writer, and speaker who founded the International Arts Movement (IAM) in 1992. A presidential appointee to the National Council on the Arts (2003–2009), he has contributed internationally as an advocate for the arts, speaking with decision makers and advising governmental policies on the arts.